Dragon Ball Legends has been just released for mobile devices by Bandai Namco. It is a 3D online fighting game in which you choose your best characters for the battle and compete against other players from all over the world in real-time. The game also features story mode and event mode in which you complete challenges for rewards. 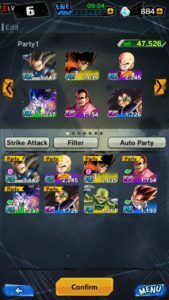 In this post we have covered everything about the game you need to know; Dragon Ball Legends guide and Dragon Ball Legends tips, cheats & strategy to win battles. In Dragon Ball Legends game, your main objective is to build the party of best characters. Check out our characters guide below and know more about best characters and how to increase their power. You start the game from story mode, which is quite easy. As you level-up, PvP mode and event mode gets unlocked. In PvP mode, you fight against other players from all over the world and improve your rank for medals. You can use medals to obtain souls; red, yellow, and blue. As you progress or move to high rank, you will face high-level players and it would be hard to win the battles. Story Mode Guide; why to play and how to play like a pro! As stated above, at the beginning of the game, story mode is the only mode you can play. The story mode is divided into chapters; completing a chapter reward you crystals, souls, Zeni, Z points, and much more. On the main screen -> tap on the story icon -> choose “select story” or “newest chapter”; to repeat choose “select story”, to play new chapter, choose “newest chapter”. Here are some tips to play story mode like a pro! Before you start the chapter, go to challenges tab and check out the challenges; complete these challenges in the first turn to get free rewards such as crystal, Zeni, souls, and much more. And most important; you earn character EXP. Character EXP is required to level up a character. Only those characters will get EXP who are in your party. To edit the party, go to menu ->characters -> edit -> select the characters. You can select up to six characters. And you can create seven parties with different character combination. Before the battle starts, you can select any one of these seven parties. Dragon Ball Legends game features dozens of characters. You can check the complete list in the menu -> characters -> character list. Tap on a character to check its battle style. For instance; Krillin is a defense type character, Shallot is of melee type, Goku(extreme); melee, Super Saiyan Goku; ranged type, Tao; support type. For instance; check the enemy character’s element; if it’s red, then choose blue element character. If it’s yellow, then choose red element character. Go to characters section -> hold down on a character and check its element. How to unlock characters in Dragon Ball Legends? It’s very simple. Go to menu -> summon -> choose “single summon” or “consecutive summon”. Get the character shards. Consecutive summon is best; you will definitely get an extreme or sparking character[initially]. You can add stars to your characters using limit-break. All you need to do is gain enough Z power. For instance; I have Goku(hero). Now, to limit-break Goku or add a star to Goku, I need Z power(Goku). How to get? Use summon feature. Why is limit-break important? Because it increases the power of your character. You can earn friendship points by playing the game; just select those characters. You can teach Shallot “Special Move” or get item reward by getting friendship points. There are many types of souls; red, blue, yellow, super souls, and more. You use these souls to increase the stats of your characters. For instance, I want to increase “defense” stats of my character “Super Saiyan Goku”. And for this, I need souls. How to obtain souls in DB Legends game? Play story mode, repeat the chapters and earn souls. Play PvP mode and earn medals. Use medals in exchange shop to get souls; red, blue, yellow, super souls, and more. Tap on a boost(i.e. health, strike attack, blast attack, blast defense, or more) and then tap on OK. Spend souls and Zeni to increase your stats. What is class-up in Dragon Ball Legends? When you unlock the ten tiles(i.e. 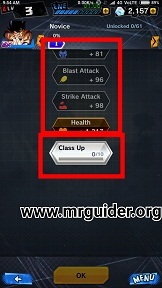 strike, blast, health, and more), class up feature gets unlocked(see the above picture). When you class up a character, that character will get bonuses. You can class up a character when the character reaches level 300. Read Dragon Ball Legends cheats, tips, strategy below to learn how to level up fast. 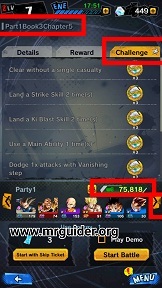 In Dragon Ball Legends, your main task is to build the best party. At the beginning of the game, you have thousands of crystals. Go to menu -> summon -> spend your crystals and summon characters. If you use consecutive summon, you will definitely get one or two rare characters; extreme or sparking. I got Super Saiyan Goku, Nappa, Pan, Raditz by using my free crystals. It would be better if you summon characters instantly when you start the game. You just have to focus on your “six” best characters. However, in PvP Mode, you can select up to 3 best characters. Don’t spend your in-game items in developing all the characters you have. Just focus on six characters; Shallot, Super Saiyan Goku, and rest 4 more[as per your choice; extreme, sparking]. Summon characters and build the party of best characters; Shallot, and 5 characters[extreme, sparking]. In Dragon Ball Legends, you can easily unlock all the characters within a week; always choose crystals as your login reward, complete missions and challenges to earn crystals, take part in events. Reach level 300 as soon as possible and then show your skills in PvP. 2.) How to Level-Up Fast In Dragon Ball Legends game? You need training material to start training. Send your low-level characters on the adventure to obtain training material and Zeni. Go to menu -> adventure -> select low-quality characters or those who are not in your party. They will bring the training material for you. Leveling up = More Power, Class-Up. Rising Rush is the powerful attack in Dragon Ball Legends game. And if you are playing PvP mode, it would be better to activate it as soon as possible and use at the right time. Additionally, you should also use the main ability of your character in the battle to get bonus advantage. Don’t know how to cast or land rising rush skill? We have posted a full guide on this topic, you can check -> Here. As you know, Rising Rush is the powerful attack and using Rising Rush, the players can easily reduce the HP of a character or K.O. How to break Rising Rush or how to protect your character from Rising Rush attack? It’s very easy. All you need to do is “swipe left or right”, it means, you just have to dodge at the right time. When you see the opponent is going to use rising rush, swipe right or left/dodge[timing is important]. You can select up to three characters for the battle. Select the best characters of your party. I would recommend you to swipe left/right/dodge instantly when the battle starts; it will save you from opponent’s attack[first strike] and you will be able to use your basic attack and then cards. If you get successful in striking first, then tap on your all cards to perform combos. Rising Rush attack can lead you to the victory and if you are struggling, this attack can save you. Read the rising rush guide here. Make sure you activate it as soon as possible but use it at the right time. Main Ability gives a bonus advantage to a character in the battle. All you need to tap(a certain number of times) and tap on the character’s icon. You can read main ability guide here. Ki-Gauge/Mana, cost of an art card restores automatically. Without it, you can not use cards. To restore it fast, hold down on the screen. 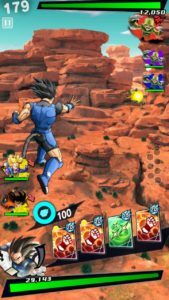 So, these are Dragon Ball Legends cheats, tips, & strategy guide for the beginners. As usual, it starts with a tutorial in which you learn about the basic of the game; how to play Dragon Ball Legends, about cards, upgrading, leveling up, souls, and much more. After the tutorial, the player manually handles all the things. You can adjust the graphics and quality settings in the other section. The Basic – In Dragon Ball Legends, before the battle starts, you have to choose your best characters/fighters. Controls are pretty simple; you just tap on the screen for normal attacks, swipe left/right to dodge, hold down your finger on the screen and swipe left/right/up to navigate your character. Tap on the cards to cast the skills. The player can switch between characters in the battle. Your objective is to defeat all the enemies. The initial levels are easy to clear, but, later it becomes more challenging and you have to power-up your characters to slay down the powerful enemies. You start the game from story mode. The story mode is divided on the basis of difficulty level; normal and hard. To switch, go to story mode -> archive -> tap on the normal button to switch to hard mode and vice versa. To successfully complete a chapter, you have to complete challenges such as land a special move, strike skill, blast skill, 3* substitution, and much more. To check these challenges, select a chapter -> go to challenges section. Completing these challenges will reward you crystals. Most of the heroes are locked at the beginning of the game. You can summon a hero/character using crystals. Tap on the menu -> summon -> confirm. We will update this list of characters in Dragon Ball Legends game when the update brings a new hero to the game. In Dragon Ball Legends, characters’ attributes are different from each other; battle power, arts, and ability. You can increase these stats by upgrading your characters. Go to menu -> characters -> character list -> tap on a character -> show details -> arts -> here you can check all the details. 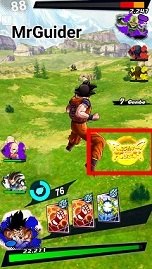 In Dragon Ball Legends, you can activate the main ability in the battle by tapping on the character after a certain amount of time has passed. To check the main ability, go to character’s info panel and head to the ability section. Once you earn a certain number of shards of a character, Z ability gets unlocked. Z ability is different for each character. To check the Z ability, go to character’s info -> show details -> ability. The soul is one of the main items in Dragon Ball Legends game, used in enhancing the stats of a character, upgrading the equipment. You obtain these souls from story mode, events, and in exchange for medals. To defeat the powerful enemies in the battles, you have to increases the stats of your character. There are a number of ways to increase the power of characters, one of them is soul boost. In this, you use souls to enhance the stats or increase the battle power of a character. Go to menu -> characters -> soul boost -> select a character -> confirm -> now select the tiles[energy, strike, blast, and more] and tap on the OK button. Class-Up -> Once your character reaches its max level(99), you can use it. Open enough boost panels and reach the max level to unlock boost core, unlocking the boost core results in class up, allowing further enhancement. Another way to increase the power of characters in DB legends is equipping the equipment. You get the equipment as rewards. Go to menu -> characters -> change equip -> tap on an empty slot and select the equipment. To upgrade an equipment, you need souls. Go to menu -> characters -> equipment upgrade -> select the equipment you want to upgrade and confirm. Upgrading equipment unlocks new ability which overall boost-up the performance your characters in the battle.